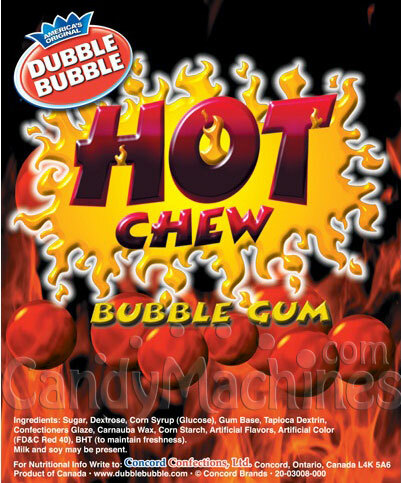 Get ready to feel the burn with these hot chew cinnamon gumballs which are designed to vend in 1 inch gum ball machines. They will always leave you with a lingering tingle that will make you want more! They have a bright red coat and bear the white 'DUBBLE BUBBLE' logo. The hot cinnamon flavor always helps to freshen breath. Need a machine to dispense these great gumballs? Be sure to see our full line of gumball vending machines. 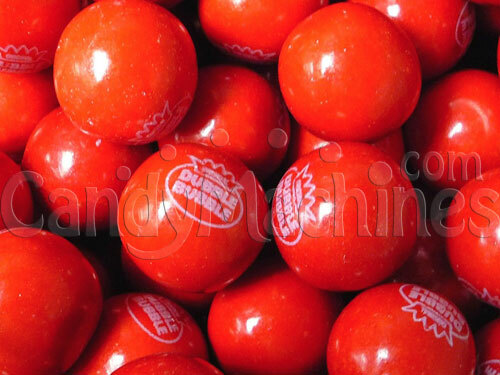 Made by Concord Confections, Ltd., these bulk vending gumballs are OU Kosher Certified. One inch gumballs typically vend for 25 cents in commercial vending machines that have a 1" gumball dispensing wheel /toy capsule wheel. Gumballs store best in a cool, dry, low humidity location. Their shelf life can be up to 18 months if not exposed to extreme hot or cold temperatures. from Denver Packs some heat! These gumballs are delicious and have a great cinnamon kick!